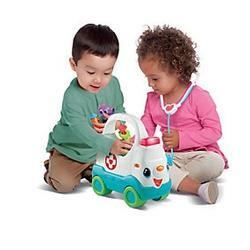 Tickle their funny bone and make checkups fun with role play. Hear the syringe squeak when you practice giving a vaccine. Check an earache and give the all clear with the purple otoscope. Practice using the play thermometer and find out if you have a fever. Practice using the stethoscope like a doctor and pretend to hear a heartbeat. Roll the ambulance or press the siren to learn about health and hygiene. 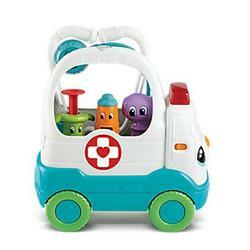 Race to the scene of the boo-boo and use 4 checkup tools to help patients. 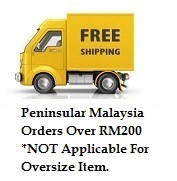 Recommended Age : From 2 to 3 Years Old.